Over-braking. Braking too hard and locking up the wheels. Skids also can occur when using the speed retarder when the road is slippery. Over-steering. Turning the wheels more sharply than the vehicle can turn. Over-acceleration. Supplying too much power to the drive wheels, causing them to spin. Driving Too Fast. Most serious skids result from driving too fast for road conditions. Drivers who adjust their driving to conditions don’t over-accelerate and don’t have to over-brake or over-steer from too much speed. Rear wheel braking skids occur when the rear drive wheels lock. Because locked wheels have less traction than rolling wheels, the rear wheels usually slide sideways in an attempt to “catch up” with the front wheels. 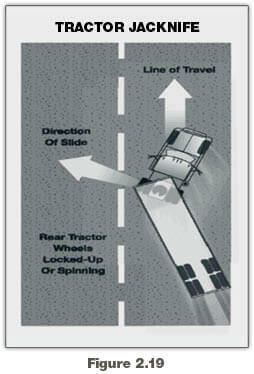 In a bus or straight truck, the vehicle will slide sideways in a “spin out.” With vehicles towing trailers, a drive-wheel skid can let the trailer push the towing vehicle sideways, causing a sudden jackknife. See Figure 2.19. Do the following to correct a drive-wheel braking skid. Stop Braking. This will let the rear wheels roll again, and keep the rear wheels from sliding. Countersteer. As a vehicle turns back on course, it has a tendency to keep on turning. Unless you turn the steering wheel quickly the other way, you may find yourself skidding in the opposite direction. Driving too fast for conditions causes most front-wheel skids. Other causes include lack of tread on the front tires and cargo loaded so not enough weight is on the front axle. In a front-wheel skid, the front end tends to go in a straight line regardless of how much you turn the steering wheel. On a very slippery surface, you may not be able to steer around a curve or turn.